Step 2 Go to ‘Information’ screen and click on ‘Install Sample Database’ button ( Fig 1 ). 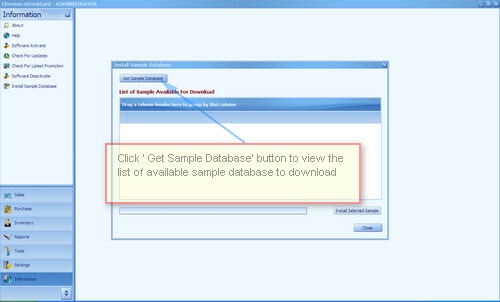 Step 3 Click on ‘Get Sample Database’ button to view the sample database that available to be download ( Fig 2 ). 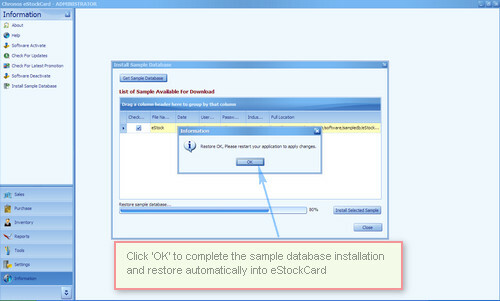 Step 5 Click ‘OK” when system prompt you to restart the eStockCard to complete the process ( Fig 4 ). 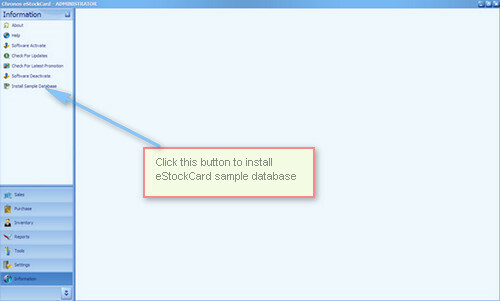 Step 6 Once the process done, click ‘Close’ button to close the screen then restart eStockCard application. 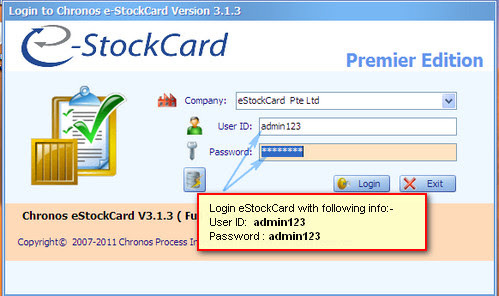 Step 7 In the login screen, login into eStockCard with User ID admin123 and also the password ( Fig 5 ). Step 8 Now you be able to login into the eStockCard with the sample database. What happen if I have forgotten my User ID and Password (for Testing Database only)in the eStockCard Inventory Software?